Feel Good Inside & Out! Get our Hair, Skin and Nails Support, which contains biotin! Plus, we’ve packed organic fruits, vegetables, herbs and vitamins into an easy-to-swallow pill. Provides 3,000mcg of biotin to help support hair, skin and nails. Contains amla fruit. 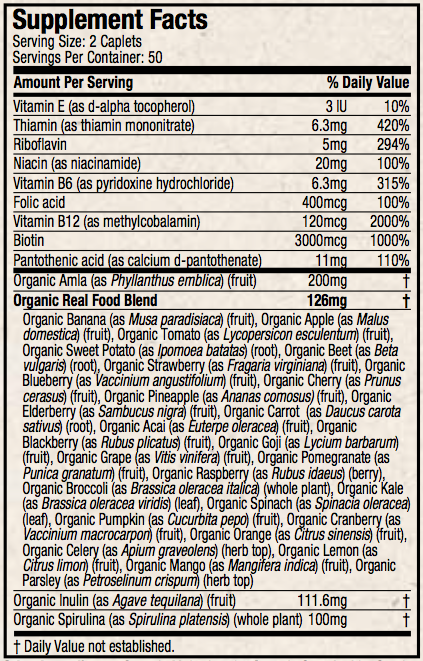 Provides antioxidant vitamin E.
With 28 organic fruits, vegetables and herbs. Purely Inspired® Organic Hair, Skin & Nails Support provides 3,000mcg of biotin full-spectrum B-vitamin complex. It contains amla fruit and provides antioxidant vitamin E. The real food blend is comprised of 28 organic fruits, vegetables and herbs. Containing ingredients grown without the use of unapproved, synthetic pesticides and fertilizers, Purely Inspired Organic Hair, Skin & Nails Support is certified organic. It’s formulated with non-genetically modified ingredients and a vegan-friendly formula. What does this mean for you? Being organic and vegan friendly, it aligns with your values, so you can feel good about what you're taking. In every way. There are 100 caplets in each bottle and 2 caplets equal 1 serving. Therefore, we provide 50 servings. We offer a 100% money-back guarantee. Simply return to the place of purchase within 30 days with the original receipt for a refund.